The focus of this meeting was on cerebellar cell & network models. See the slides below from a number of the presenters, or see a blog post from the OpenWorm project on the meeting. One specific outcome of the meeting was the setting up of a project to try to create a community developed model (or models) of the cerebellar granule cell. If you have any enquiries about this meeting, please don’t hesitate to contact: p.gleeson@ucl.ac.uk. Location: University College London, UK. 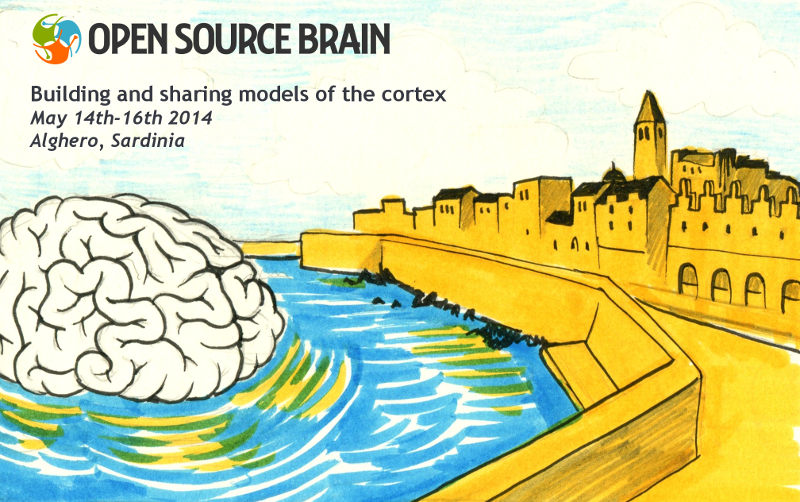 The focus of this meeting was on open source multicompartmental, conductance based cortical cell & network models. There are an increasing number of multicompartmental, conductance based (thalamo)cortical cell models being made available and reused/modified by interested parties to address different scientific questions. An example is the Traub et al 2005 thalamocortical network model for which Fortran, NEURON, MOOSE and NeuroML versions have been developed in various labs. This meeting was to look at the range of models out there from the neocortex and thalamus which are interesting for multiple parties and work towards getting these onto public, open source repositories, in standardised formats (NeuroML & potentially PyNN) and get them well tested, annotated and ready for use as research tools by the attendees and the wider community. 1) Consolidate the versions of the Traub network model which aim to reproduce the results of the 2005 paper; document what stage these versions are at and what the issues are with each implementation. 2) Create plans for a new network model at this level of detail, with updated cells and connectivity, initially based on a refined Traub model; this model should be open source from the start and as simulator independent as possible; gather requirements on the experimental data needed for this updated model and the electrical properties they should display; create a framework for optimising these models against the data. What can Traub’s model tell us? Research interests for modelling a detailed compartmental TC columnar loop [Compartmental modelling versus spiking neurons]. Can we match (any) experiments? If so which kind? Inconsistencies in existing L5 Pyramidal cell models - a comparison. A consensus on a good model on L5Py cell. Nomenclature consensus for single cells - essential for interchangeability and testing. Milestones for the next meeting and commitments for parties towards development. Debate on “columnar structure” of cortex - if this is the right way to think about cortex? Automated testing tools - fortnightly tests depending on participation. A list of the priorities/agreed action points from the meeting are here. The meeting was held on the main UCL campus: http://www.ucl.ac.uk/maps. Room for both days was: Foster Court 243. This meeting was the second main meeting of the Open Source Brain initiative. There are an increasing number of cortical cell and network models being developed and made publicly available, from networks of leaky integrate and fire neurons based on cortical connectivity and firing properties, to multicompartmental, conductance based cell models. Many of these are being reused, reimplemented and extended to address new scientific questions by labs around the world. In this meeting, we looked at the range cortico-thalamic models out there which are of widespread interest and discussed the best ways to get these into public, open source repositories, in standardised formats such as NeuroML and PyNN. We investigated the steps needed to ensure these models are well tested, annotated and ready for use as research tools by the attendees and the wider community. There were presentations from experimentalists who are producing the data to constrain these models, as well as simulator and application developers who are creating the infrastructure to build, simulate, analyse and share the models. There was a NeuroML Editorial Board meeting held prior to the main OSB meeting on Tues 13th May. Minutes of this meeting can be found here. Ole Paulsen Oscillations and resonance in hippocampal neurons. Michele Migliore Modeling the effects of electric fields from power lines on hippocampal CA1 pyramidal neurons. Padraig Gleeson Requirements gathering for OSB: What is needed for truly collaborative model development in computational neuroscience? Neuroscience has traditionally been a discipline where isolated labs have produced their own experimental data and created their own models to interpret their findings. However, it is becoming clear that no one lab can create cell and network models rich enough to address all the relevant biological questions, or to generate and analyse all the data required to inform, constrain, and test these models. The success of the open source software development movement suggests that both model building and data collection/curation would be greatly enhanced by public, collaborative efforts to solve these problems. This workshop highlighted several examples of such efforts taking place in neuroinformatics, and presented open tools and resources that can be instrumental in facilitating further efforts. See here for more information on speakers etc. This meeting was the third main meeting of the Open Source Brain initiative. As with past OSB meetings this workshop provided an introduction to the OSB initiative and associated technologies and there were a number of presentations from modellers, experimentalists and tool developers interested in creating open, community developed models of neuronal systems. 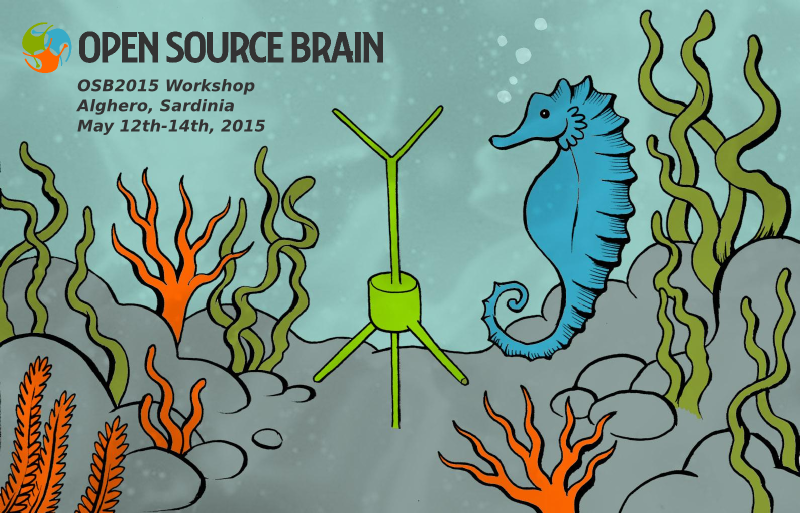 One day of the meeting was dedicated to creating and sharing experimentally constrained models of the hippocampus. There was a NeuroML Editorial Board meeting held prior to the main OSB meeting on Monday 11th May. Discussion session How do OSB and related technologies fit into wider initatives in neuroscience? Building and analysing biophysically and anatomically detailed neuronal networks is a complex and time consuming task, which ideally involves researchers with a range of backgrounds and technical skills. However, most labs cannot expect to have all of these researchers present at any given time. This can lead to stalled projects, lost data/software and needless repetition of experimental and computational work. A number of initiatives have been started which address these issues. Some are creating public resources with freely available data to constrain such models. Others are using best practices from open source software development to encourage building and sharing of models in a collaborative environment. This workshop served as an informative introduction to these projects as well as a discussion forum for getting feedback and gathering requirements from the community for the developers of these initiatives. Detailed computational models are critical for elucidating neuronal and network function. collaborative model development in neuroscience. More information on the conference, and details on how to register can be found here. A number of groups around the world are developing complex, experimentally constrained models of cortical function. Creating the software infrastructure to develop, simulate and share these types of models takes a significant amount of time for any of the groups involved and there can be a lot of overlap, duplication in work and repeated effort. This workshop was organised to highlight some of the initiatives currently underway to build detailed cortical models as well as those projects building the infrastructure to make it easier to develop, disseminate and compare the models. Attendees of this workshop were provided with an overview of the state of the art in large scale cortical model development and the efforts underway to make these more accessible and reusable for other researchers. 12:00 Open Discussion: How best to move forward and what needs of the community are not being met? How can the SIG help in this respect? A short report following the workshop, along with links to the presentations, can be found here. A workshop at Neuroinformatics 2018, Wed 8th August, McGill University, Montréal. 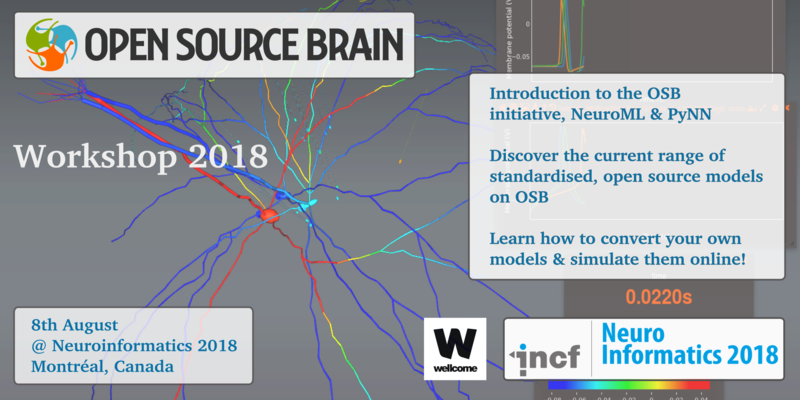 This workshop will give an introduction to the background and aims of the Open Source Brain initative, show some of the cortial, cerebellar, hippocampal and other models which have been made available on the repository, and highlight the recent functionality for viewing, analysing and simulating models through the OSB website. There will also be introducations to NeuroML and PyNN, the main standardised formats supported by OSB, and we will demonstrate the options for converting your own models to these formats to make full use of the features of OSB. 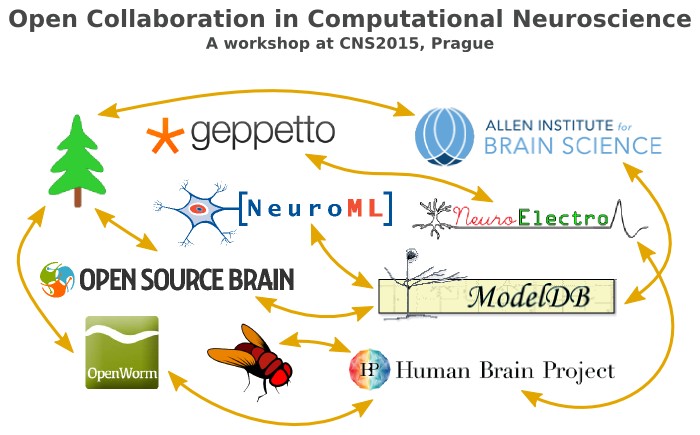 The workshop will take place on the morning of the day prior to the main Neuroinformatics meeting. Registration: The workshop is free, but registration is required. Please register here. As part of the Hackathon sessions (taking place in Thompson House in the ballroom), the speakers will be available for hands on assistance using OSB & converting models to standardised formats.